Just because there’s a chill in the air doesn’t mean we should skip fresh salads. In fact, at this time of year it’s more important than ever that we boost our immune system with healthy greens and grains – and not just for keeping the doctor away. Hardy cold weather salads are a welcome addition to any holiday table. Deeply flavorful and unabashedly colorful, wintery salads are hefty enough to absorb copious handfuls of nuts, fruit and grains while providing a beautiful addition to a special meal. Even the non-meaters will gobble them up, while the vegetarians will be very pleased with this substantial option. This is one of my favorite cold weather salads. 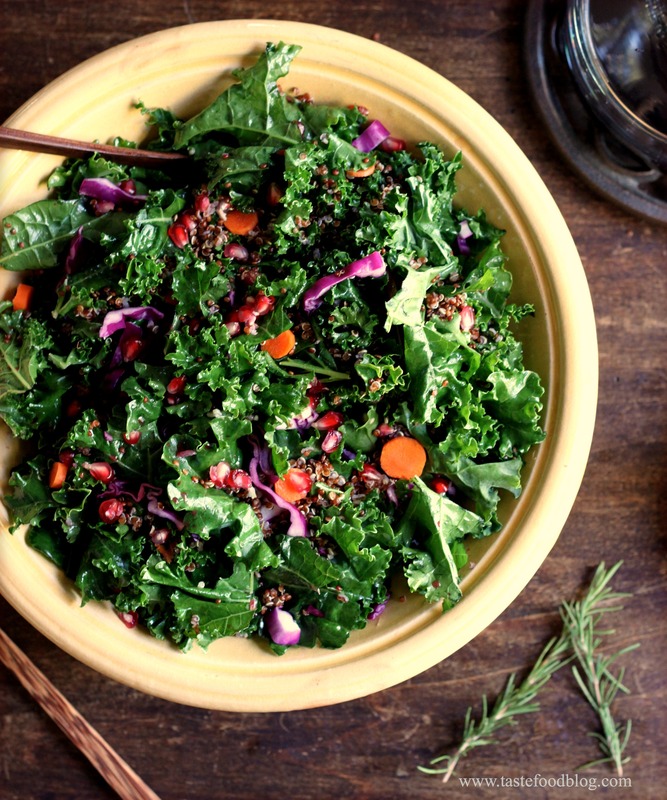 Brimming with curly kale, red cabbage, and quinoa, it could be a meal in a bowl. The addition of dried raisins, toasted almonds and glistening pomegranate seeds adds all the extra bling necessary to invite this salad to your Thanksgiving dinner. The key to this recipe is to massage the kale. Yes, that’s right. By gently rubbing the leaves in oil, lemon and salt before assembling, the leaves will be coaxed into a softer and milder version of themselves, making for a delicious raw salad. Unlike most salads, this may be entirely prepared up to 1 hour in advance, which is ideal for entertaining. Serves 6 to 8. For the kale: Place the kale in a large serving bowl. Drizzle with the olive oil, lemon juice and salt. Using your hands, gently rub the leaves to coat for about 1 minute. Let stand at room temperature for 30 minutes (or refrigerate for up to 2 hours). For the dressing: Whisk the garlic, vinegar, mustard, salt and pepper in a small bowl. Add the oil in a steady stream, whisking constantly to emulsify. Assemble the salad: Add the cabbage, carrots, shallot and quinoa to the kale. Add half of the dressing and toss to combine. Scatter the raisins, almonds and pomegranate seeds over. Gently toss with more dressing to taste. Serve immediately or refrigerate for up to 1 hour. This is a stunning salad, Lynda! I always appreciate a salad or greens of some sort on the holiday table to balance out all the rich eating, and this one is very appealing. And I love that kale salads can be made ahead and just get better with a bit of time! A beautiful salad and great combination of flavors! Love the red quinoa here – beautiful colors, a perfect autumn salad. One of the often overlooked qualities of kale salad is it holds so well and can be made ahead to enjoy later. With the smashing color combination of red and green this is indeed a holiday salad at it’s best.